1/10/19 Together Again - Colonial & Brandywine PLC (Minka & Wolfe) A year-long Phys. 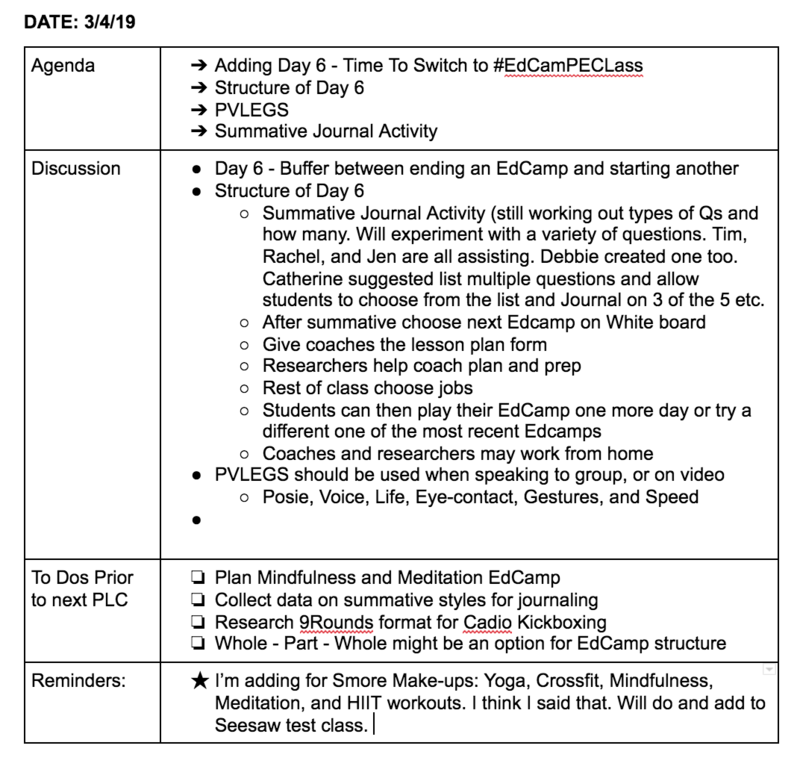 Ed PLC has begun to improve the #EdCampPEClass Learning Experience! Amy & I PLCed during the 2014-2015 school year, and it was so beneficial. Our focus was on using technology in PE, and the notes can be seen by scrolling down this page. We will now focus on improving a learning experience for students - called #EdCampPEClass. 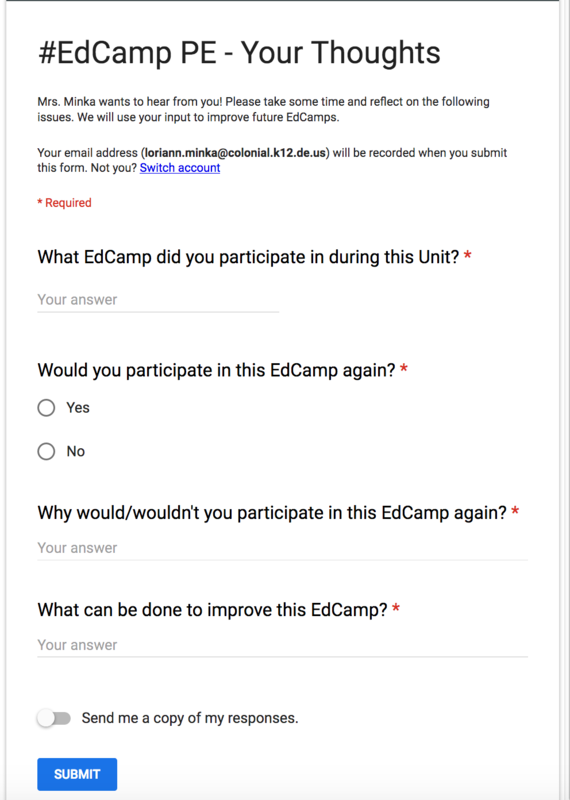 We hope to find value in reconnecting to enhance #EdCampPEClass curriculum. Amy has since switched to Brandywine High School. We're using FaceTime, and or Google Hangouts to PLC. We plan on following the format to keep our PLC moving forward. Thanks for checking it out and if you want "in" let me know! ​Reflection on PLC (Shared w/Group)-On a scale of 1 to 5, how effective was our PLC today? Reflection on Personal Growth (Personal Reflection)-How did I grow today as a result of the PLC? Missed Posting 2 sets of notes. Final PLC with Ms. Ashby - She helped set-up EdCamp format in Schoology for the 4th Marking Period. Once Google slide project is complete we will begin to use those assessment pieces built in Schoology. Missed one meeting with Ms. Wolfe as the Google slide project was time consuming to build. It's finished and should be great moving forward. Each student got a bite sized piece of a standard, ranging from the middle school to the Level II standards. Over 150 questions were created for students to build a slide around. We visited the Innovation Learning Center and it was a great expereicne. Not all appreciated not being in the gym, but their work was decent! Very pleased with the work! Will highlight the top 15 under the EdCamp Tab - student work - in a slide show format. See below for just an image of what they created. Should be visible by April 19, 2019. 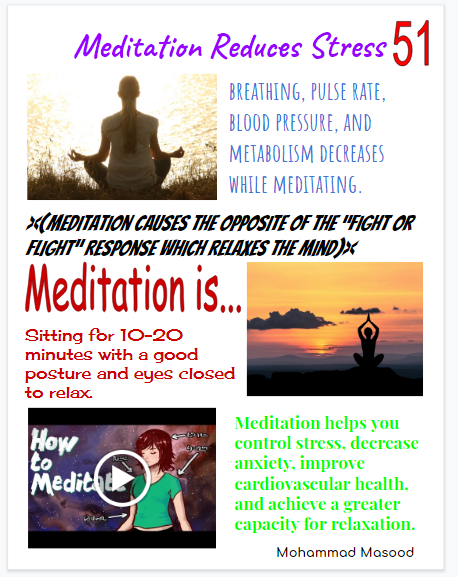 New Mindfulness and Meditation Unit - #EdCampPEClass - Loving It!!! 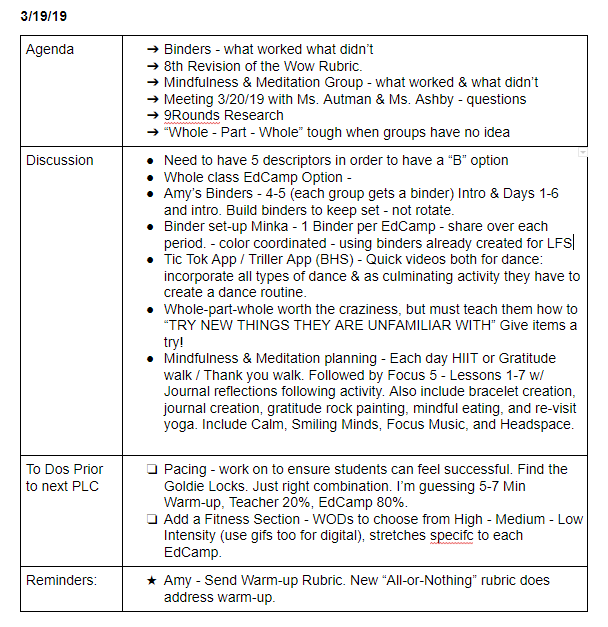 2/28/19 PLC - Spent with Rachel Autman & Jen Ashby for assessment & rubric creation session for #EdCampPECLass program. 2/8 - 4th PLC Meeting - New format for ease of use below. Minutes will be in from newest to oldest for less scrolling! Organization ease - Tools / looking for one great tool to marry paper docs and digital docs. 2. What's working with #EdCampPEClass & what's not? 1. Q1 What are the students learning? Worked on revising "Day 5 Time To Shine" Rubric: Putting it all together. 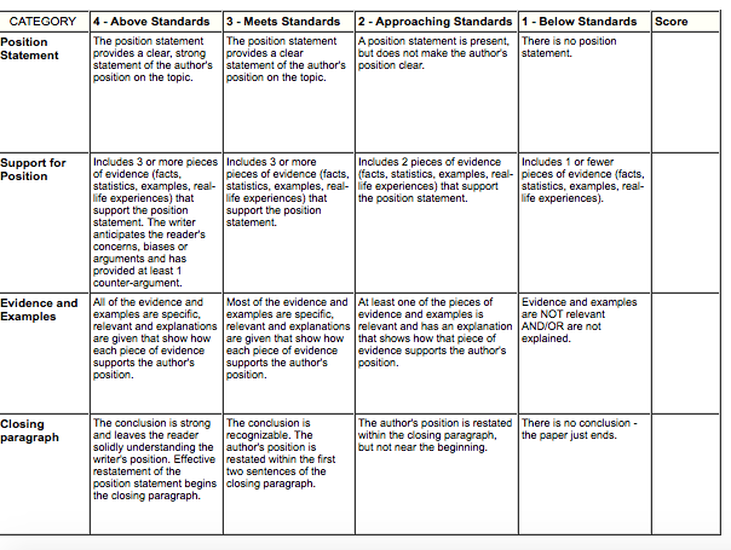 Reviewed Rubric in Schoology of putting it all together! Add specific directions for how to upload and complete tasks. Set Next Meeting for 1/16/19 Will use the two following resources shown below provide by Colonial PE Supervisor: Dr. Nick Baker! Thank you!! Add different words to the Day 5 summative assessment to include Yoga, Kickboxing, Dance, Gymnastics, Tai Chi ect. Day 5 Summative - add (what I can do to improve or what did I do well) - in Evidence box listed on the assessment. Evaluate their video - This is a reflection rubric in your packet. a badminton tournament - singles tournament. Day 5 - Rubric - lots of standards in 1 rubric - may be OK! Communication, Self Management, Safety, Social Responsibility - Each should be it’s own rubric. Attempt to incorporate Restorative Practice pieces: Ask questions: What were you thinking when … Who is affected by what you did? How can you fix it? Share the expectations of each day 1, 2, 3, 4, 5 with rubrics. Students should see the assessments ahead of time to guide their learning. Do your EdCamp 1 more day - Students can choose to participate in their #EdCamp one more day or choose another EdCamp to try. Begin creating Google Slide presentations for our 20% time. Menu video of possible EdCamps that students can choose from. Give them ideas as to what they can do in EdCamp! Slide show for all the EdCamps they could do and all the equipment that we have. Will have a generic digital citizenship rubric that we’ll place on each day of EdCamp as we use SeeSaw & Schoology everyday. Use of Technology Rubric should always be in effect when creating, curating, and sharing digital material. 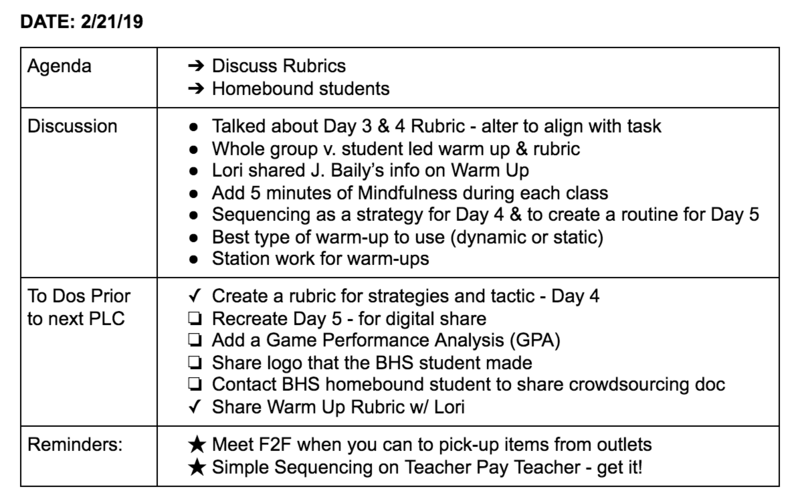 So, instead of trying to add a technology portion to each rubric - create a template that covers tech use and alway include with each day’s tasks. Will meet with Rachel for Rubric writing & decide how to move forward. Meeting with tech coaches to decide how all should be organized. Will take notes! Make 4-3-2-1 smaller on Summative Day 5 for more space to write. Create format and directives that specifically deal with this PLC process. Answer 4 questions! 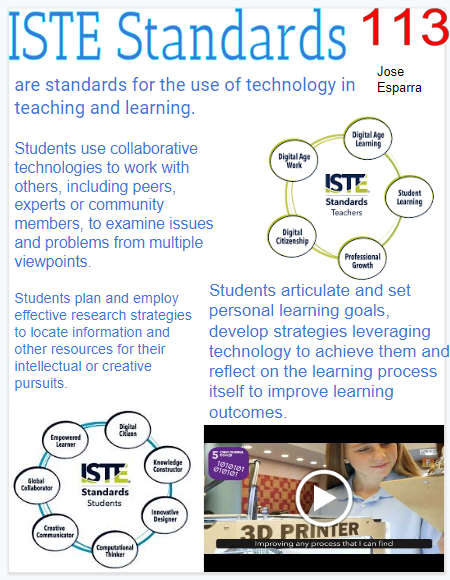 Create a master tech rubric that addresses personal responsibility and ISTE standards. Adapt colonial PLC doc to our needs. Day 5 Time to Shine - Make 4 - 3 - 2 - 1 smaller to give more evidence. Discuss Rachel & Tara / Jen’s suggestions moving forward. My New PLC 2015 Is Through Voxer! Map Created by Osama Abujafar & Voxer Voted "Best PD Ever" by Justin Schleider (Voxer King) Amy Wolfe you were an awesome PLC buddy, but I think we have some help now!!! Ubersense - Amazing video tool to help students see themselves performing a skill. The merge button can overlay two videos to view at the same time. Try Kevin Tiller's recommendation on Crawl Creator, create, export to camera roll, which then can be used in iMovie. Time: 6:0 a.m. - 7:00 a.m.
1. Shared data on DDI / Close Read. PE scores lower than normal. We are guessing they saw baskets, ping pong, badminton, volleyball equipment set-up and knew when they were finished they could play. So, they rushed to finished in order to play. 2. Completed bid list process, shared what to do via eschoolmall. 7. Ms. Wolfe create a new page / PD page / add PLC page. Time: 6:05 a.m. - 7:05 a.m.
3. Still not able to share exit ticket for volleyball. Contacted company, but no response as of yet. 1. Reported on Speed Stacking and Schoology trainings Looked at Speed Stacking and where we could purchase a trial set quickly training was great! Marbles at the Mall and Learning Express. Schoology was basic introduction to use, creating profiles, and uploading information. 2. Shared the Online classes for Tech Education: GBDE free classes. Not coming up on my Google Search will double check the Letters to link on my home bookmarks. 3. Shared how to annotate PDFs on ipad class from GBDE. Annotations for PDF can allow marking ups, stickies, and hand written notes by students when reading online information. I will share link next time so admin can view and use as well. Looked super beneficial. 4. Create WPs first Educreations video to use during the volleyball unit. Ms. Wolfe shared use of extended thinking strategies with using Educreations. 6. Set-up TodaysMeet for the presentation on Tuesday 4/8/14 so teachers could ask questions. 4. Compile information and programs from Sheri Towner-Gabrelcik for Smoking Cessation program, guest speakers, KGB all supported by the Wellness Initiative for the Community Transformation Grant. 5. Get link for GBDE free tech classes, and PDF annotations video link. 4. 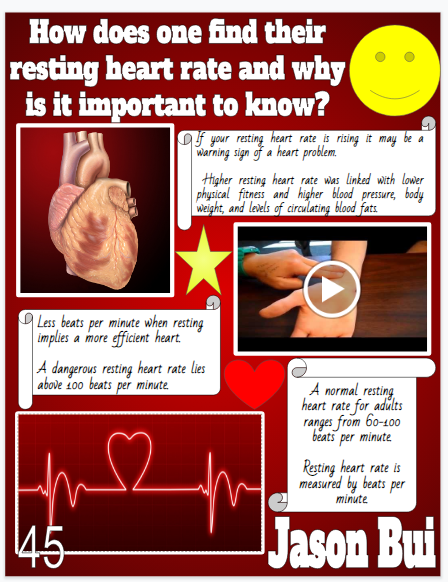 Create DDI and close read questions with Kidshealth / Teen Health articles. 3. Share google docs from Snow PD's that we attended and can share. 3. Found excellent Twitter resource in "Exit Ticket" - a student response system for in class using tech: create a class, send out exit tickets, and collect the data. Will both work on daily soccer exit tickets and compare data at next PLC. 4. Reviewed strategies for increasing student achievement, thinking words, and examples of questions for DOK 1 Concepts and DOK 2 concepts, for complexity and connections. 5. Discussed what "Bottom Line Strategies" are with readings. Answers - What, How, and Why. 6. Discussed using Today'sMeet as a way for students to communicate, collaborate, ask questions. 1. Email Tara Amsterdam about saving back channel comments and questions for data. 2. Use argumentation for writing for CCSS - quotes and "videosnapshot" strategy - 4 square questions. 3. Continue to use "Right is Right" and log results, increase wait time and don't be impatient! 5. Possibly create a usable form that will help us compare data, and /or review Ed Tech tools or other items of interest..
3. Try Backchanneling with Today'sMeet or coveritlive if you can't get Today'sMeet to work. 1. Voted to keep this eval tool: Evaluation Tool and will look at areas that scored below a 7 to focus on for improving. 3. Tried to work with Google Forms and Flubaroo to create and grade our Badminton Unit Test. Issues with having to re-grade after each submission - Flubaroo online help with videos You will have to switch to Internet Explorer at this time as the videos are NOT showing in Chrome. State of Delaware is aware of the problem. 4. Determined to use the Kids Health article about Self-Defense for our next Close Read and DDI. 4. Compare questions created for close read / DDI using the Quadrant Questions and requirements from Wallin. 1.Visit Dr. Baker's email with weekly workshop reminders! Awesome list!! Thank you Dr. Baker! 2. Ask for permission from Dr. Baker to watch any of the Spark Webinars that you may be interested in completing. 4. Look at Calendar to help with revisiting scope and sequence for health and addition email items from Dr. Baker on 3/17/14. Time: 6:00 a.m. - 7:10 a.m.
4. Discussed Tweet Deck to organize those learning communities. so put the summarizing at the end. 6. Discussed Community Transformation Grant and recent meetings. Wallin not a Cohort, but should have an understanding of the process. Visit Dr. Baker's email with weekly workshop reminders! Awesome list!! Thank you Dr. Baker! Ask for permission from Dr. Baker to watch any of the Spark Webinars that you may be interested in completing. Look for close reads / DDI about PE / Fitness / or something interesting. Look at Calendar to help with revisiting scope and sequence for health and addition email items from Dr. Baker on 3/17/14. Time: 6:00 a.m. - 7:00 a.m.
1. Set Amy up in Remind101 for tomorrow's tech workshop - tested it to ensure it was working as it should. 3. Adopted "Right is Right" to use for the up and coming week. 4. Reviewed Tech Workshop Agenda, added to Tips to avoid frustration. 5. Found Weebly Webinar and will add this resource to the tech presentation. 1. Evaluate tech workshop, make changes for 4/8/14. 1. Reviewed and confirmed schedule for Wallin's incentive day at WP: Still on for 3/7/14: 12:43pm - 2:15pm. 3. Coordinated the 30 Hour PD Snow Make-up schedule. Determined if we should divide and conquer or attend the same workshops to assist us in creating similar units. With Ms. Wolfe's 90 Hours Re-cert requirement and 30 Hours of mandatory PD that must be separate she has no choice but to attend all. I will attend similar workshops of my choice. 4. Troubleshooting with Twitter based on workshop 1 - Developing a Professional Learning Network with Twitter. 1. Go to All Things PLC in order to find an evaluation tool for us to use in order to evaluate and reassess our PLC. 2. Sign-up for all PD we are interested in as per request of Dr. Baker in his 3/4/14 email. 4. Brainstorm or create a form to evaluate "Teach Like a Champion" Strategies [No Opt Out, and Do it Again] Use the data from this in order to determine what worked and what didn't. 5. Research technique #3 - Right is Right and determine to use or skip. 3. Choose additional strategies from "Teach Like a Champion"
Sign-up for all PD you are interested in attending. 1. created Ms. Muns 1st Actively Learn for a "Close Read" at Wallin. "Don't Text and Drive. If you would like to try it out request the code from pmuns@colonial.k12.de.us. 2. Troubledshot the issues with videos not showing in media box. Did a "work around" by entering a direct link to You Tube that seemed to open more easily. Amy will edit her layer in order to get that result too. 4. Peggy shared an amazing way to create sub folders. Enter assignments upon completion to formulate a day by day sub folder for an entire semester. Genius! 2. Amy - add a video in the form of a link to her layer. Text should be highlighted in blue and go directly to You Tube. 3. Peggy - try the module and take notes on issues and problems you might have. 1. Reassess needs of PLC. 2. Determine how we can look at data more closely. 3. Possibly develop more common assessments v. common tech tools or learning modules. 4. Ms. Minka is going to attempt to share to herself with Ms Muns actively learn module for Texting and Driving. 5. Explain work around for URLs that do not work. As Ms. Mun's did yesterday!! Copy into a website and copy that URL. No Don't forgets at this time!! Yay - it's the first time! 2. Finished up the Spark Basketball ( after clicking the link - scroll inside the Blendspace in order to see all the spaces, there are QR codes for the first time) unit and shared paper copies of score sheets, assessments, and task cards for in class use. 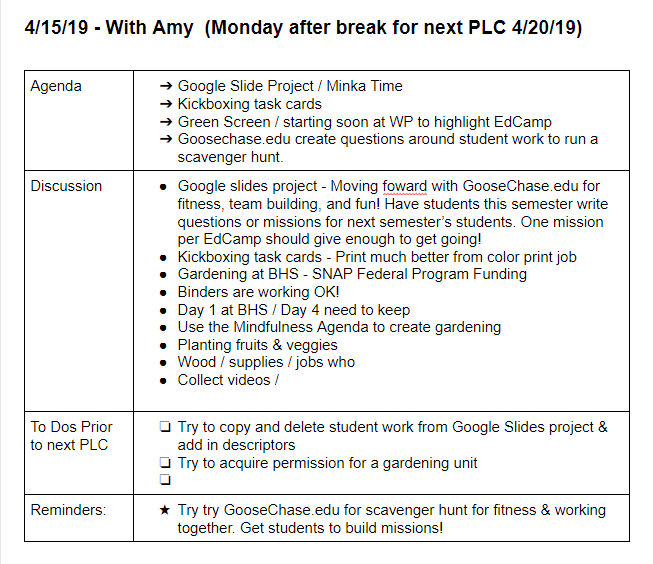 Google Drive documents for LFS and other PDFs at William Penn Lesson plan folder, 4th marking period Lesson plans Minka. 1. Amy will attempt the Actively Learn Module as a student / I already did to give her an idea how to grade using common core rubrics. 1. Reassess need of PLC. 2. Attache Common core rubrics to this email for clarification / or share on Google drive. May just forward the email as it's clean and easy to read. 1. We set-up a Flipsnack account - an online book creator: I use the "3x's Rule". Anything I hear positive comments about 3x's I will attempt to use in my class. In this case I will use this for the presentation. 2. Brainstormed better ways to present the information as a book may be too overwhelming. The Flipbook can be sent in a link to those interested in more in depth information, research, the thinking behind using tech, and addressing those concerns that tech will interfere with physical education instruction. 3. After brainstorming - it was decided that Google Slides would be used for the presentation, and the Flipbook would be a product the participants could walk away with. Key learning for the session was making an image a background. 4. We agreed that it is very important for each teacher to find a PLN (professional learning network) that inspires them and that have good solid information. Teachers must differentiate between cutesy and solid PLNs. 5, PLN information will be presented last in Google Slides, and in Flipsnack as it's ultimately what we want teachers to join and learn more about. These networks help teacher grow and develop far faster than waiting for district professional days that do not necessarily address their greatest needs. 7. Looked at my home page tech items implemented this year and placed them into categories for the presentation. Teacher / BYOD / ipad only / Computer Cart . Looking to discuss each category for 5-7 minutes. 8. Google Slides can also use the sandbox format ultimately doubling the power of the presentation, and also the slides will be given to participants as a final product they can walk away with you use to implement technology. 8. Learned that I need to sign in to Schoology using my new colonial email, not my lminka. 9. Shared Actively Learn with Ms. Amsterdam in order to have her evaluate the tool. 10. Due to the creation of this Sandbox forum, when looking for a video for PLNs I found Ning, and will be trying it for the first time ever! Also found this series of PLN network videos (I think it's like 68 vidoes... not sure exactly, but they just keep playing) I listened to them while finishing my PLC minutes. Found themwhile searching for a "what is a PLN video" These were recorded at the #Educon conference 2012 and each vidoe is short and from teachers about what it means to be part of a learning network. 1. Due to Dr. Baker's email about the In-service day on Friday current initiatives were put on hold to go through email, determine what would be done and to plan for Friday. 2. Ideas generated were for AIP / Adaptive and for regular Physical Education team sport units to be shared (skills, lead-up, and closure activities). 4. Determine rubric for Close Reads & DDI's (Dr. Erskine ... can we use Common Core Rubric for summarizing questions and or any other type of question. 5. 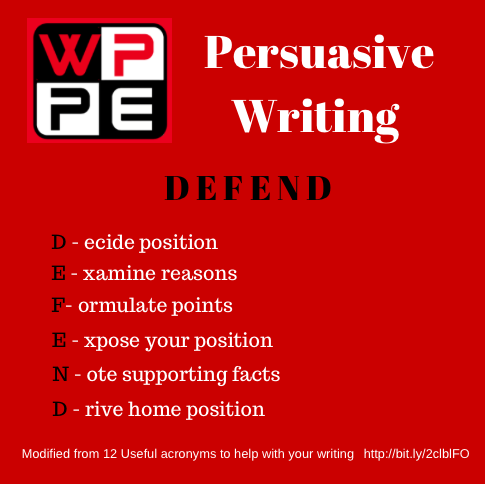 I will copy and link the Strategies Article for Self-Defense for Amy to have access too so we can begin Acquisition Lessons. 4. Find out if we need our own computers, SLM's / KUD's / Completed Units or other for Friday's afternoon In-service. 5. What stations are included, do they require equipment, and do the students go through the motions, and are they assessed? How do you know what type of effort is being exerted? 2. Chose dates for "Read with a Pen" and DDI for Self-Defense article. 3. Problem with Self-Defense Unit creation. Not many visuals or videos to match current techniques. Also, techniques used in the recent past are apparently too involved and victims aren't as successful. New techniques require less techniques, but more of an understanding to use what you can to get away from the attacker. This is a major work in progress and we may need to create our own visuals. 4. Discussed online mark-up tools to help prepare students for Smarter Balance. Still looking for a good one. 5. Reviewed status of SLM for the Self-Defense Unit. Discussed Dr. Baker's suggestion for incorporating standards into UEQ. 7. Amy shared additional interventions for students (Will Link these . This week will focus on "Put Head Down for 15 Seconds" in PE I will use to model and making light of the intervention. When students aren't behaving I will cover my face with my arm and communicate my feelings. Hopefully the humor will get them back on task. I may be "Putting my Head Down" frequently. 1. Narrowed Uncommon Impact items, Teaching Strategies, and Big Ideas that we wanted to practice this week: "No Opt Out" and "Do It Again" - are the two techniques that we will use continually in the class. Checks for Understanding this week: Explicit and Implicit are to be focused on. Click red to view those ideas, but one must sign in with their Google Drive. 2. Reviewed Physical Fitness for Life BIG Ideas (1st Google Drive Presentation) / made changes and saw confusion and redundancy in slides We Need to find visual ways to teach the students the bigger concepts more clearly and to the point. 3. Looked at Articles and tools for "Close Reads" - How to mark up readings for true understanding "Read With a Pen", and paying attention to the finest details. 4. Reviewed steps for "Close Reading"
5. Reported no extra ipad as of yet. 6. Discussed SPARK's "Observation Deck" as a technique to alter student misbehavior. Discussed "Cool Passes" to be use for calming students down. Both of use were extremely interested in techniques to help students behave. Also, discussed estabilishing creative routines (report to BullPenn) or (Dugout), Call-outs: How students respond. Many are geared for younger students. Invent our own. 7. Dr. Menzer approved Wallin's PBS day here on 1/30/14 - Discussed need for the group. 6. Research more callouts / ways to respond and creative routines. 2. Remind me to have items ready for PBS day - just shoot me an email in case I get my days mixed up! 2. Information how to ask better questions that aren't boring, too short, too long, or redundant? 3. Common Core Rubrics for Close Reads and Future DDIs. Time: 6:55am - 7:55am (1 hour late opening). 1. Discussed PE I and PE II situations where classes contained both types of students. Decided to add additional questions to Game Performance Analysis and to written assessments in order to meet the standards. 2. 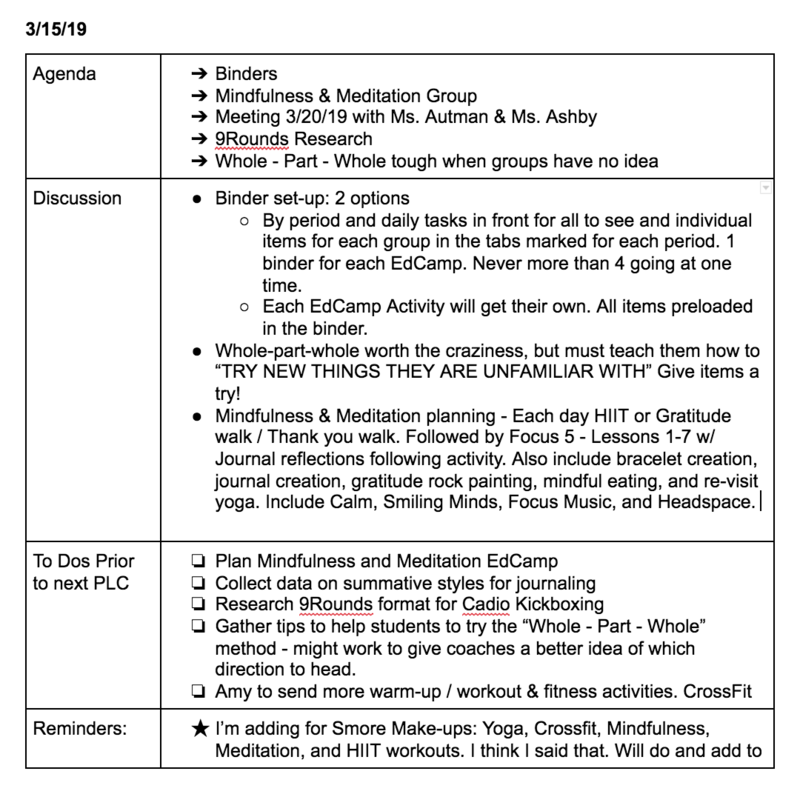 New to our PLC - Brainstormed Uncommon Impact items / or Teaching Strategies that we wanted to practice each week: Amy will share previous strategies covered at her school: This week: "No Opt Out" and "Do It Again" - are the two techniques that we will use continually in the class. 3. Decided as a PLC to focus more on Physical Fitness for Life. Find visual ways to teach the students the bigger concepts. 4. We began creating a common assessment for our two schools based on Physical Fitness for Life concepts. 5. Discussed Educreations and it's use in Physical Education with the ipad. Decided to try and incorporate this technology for game explanations. It' similar to a screen cast, but can be used to explain sports and games. Ms. Minka will borrow an ipad from the adapted PE program. 6. Discussed the use of music in PE. Ms. Wolfe is all for it, Ms. Minka will give it a try. 8. Discussed needs for Wallin's PBS Incentive day here at WP on 1/30/14. 1. See if I can get access to an ipad. 3. Try to secure WP for Wallin's PBS incentive day on 1/30/14. 5. Break Physical Fitness for Life concepts into chunks. 4. Discuss how Educreations worked - if Ms. Minka can access an ipad. 1. Amy - send me the Uncommon Impact items you've used. No additional participants (Mr. Robinson guest appearance brought donuts and coffee - thank you)! 1. Amy - email me with Professional Development wishes for Dr. Baker and I will forward them. *Addition to next PLC meeting / Syllabus revisions for 2nd Semester! *Make Changes to I Search Project - Participants see Google Drive Doc for ideas from Learning Focused. 3. Collaborated on Review for Final Exam / visual presentation in Google Presentation (completed 1/9/14) This was an amazing tool! 6. Reviewed Google Calendar and discussed a shared calendar that both can update. 1. Think about ways to share make-up information. College PLC on 1/6/14 - volunteered to do Gear for the college! 1. Fitnessgram / Reviewed process on the computer for printing out student data and student reports. c. Popcorn (Amy I forget what this one is)! 3. Discussed possibility of a Self-Defense Unit. 4. Discussed The I - Search Project and issues with google drive. MUST SHARE AND GIVE COMMENT PERMISSION. 5. Chip stated, "WP cannot put screen-cast-o-matic on Ms. Minka's computer." 6. Shared a paper calendar for the last 2 weeks of the semester. 1. attempt to comment and collaborate on a single document in google drive / we should choose "edit" so we both can edit!!!!!! The students should give us permission to comment, but we need to give permission to "edit". 3. View completed DDI Round III module. 1. Have student give anyone with a link access to comment, and again when you share with teacher. To the right of the share box it will have a smaller box that asks about comments v. editing. Choose comments instead of editing. 3. Meeting on 1/8/14 -- Wednesday after school for leadership and scope and sequence! Additional Participants: Tara Amsterdam and Melissa Johnson contributed at different meetings. 1. Discussed student who are reluctant to join google drive to do the I search project on google research. Melissa Johnson advised to give the student a hard copy, and require that they write it. d. click save button at the bottom of screen. e. Click File / MAKE COPY / DELETE THE WORDS “COPY OF” IN BOX HIGHLIGHTED BLUE AND PUT YOUR NAME AND PERIOD # IN THAT BOX!!!!!!!!!!!!!!!!! f. They can begin researching by clicking tools and chose research. g. After the completion of the first working session they MUST share back with you and give you commenting privileges. h. Good Luck & have fun researching! 4. Screen-Cast-O-matic to do this process above coming soon. We reviewed how to download, but do not have authorization. 1. Each try the process on our own. 2. Attempt to collaborate on a document from our own schools at the same time through sharing with Editing privileges. 3. Have Screen-Cast-O-Matic downloaded onto each of computers. 1. 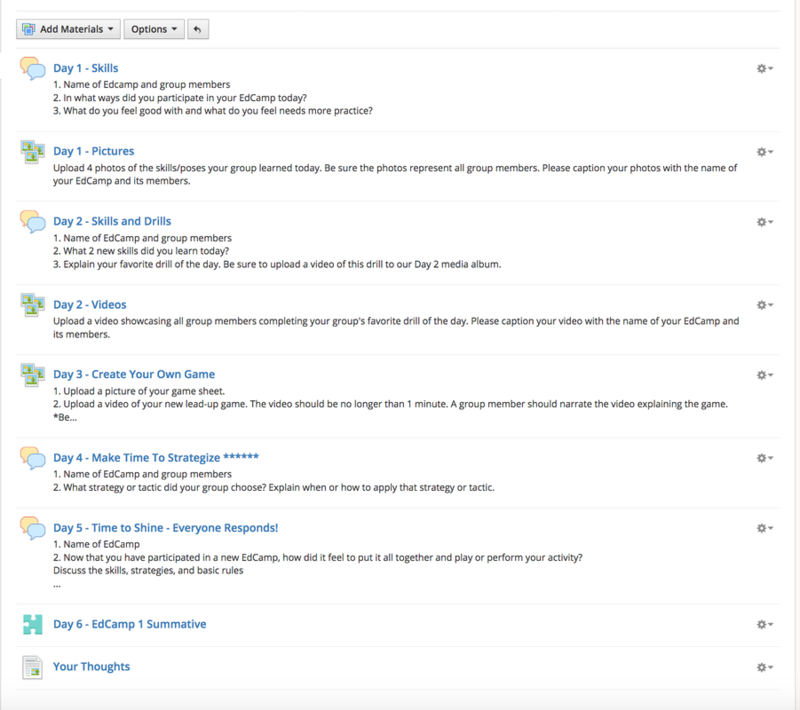 Build screencasts for us and our students to use. 1. Tech night: Tonight at Cowlyck!!!!!! 1. Shared and reviewed Marijuana Lesson. Power point / 3 charts / acquistion 1 / and KWL. 3. Discussed Launch for Google Drive I-search project, method of delivery, and how to have students get into google drive. Not sure if Wallin students have same access. 4. Reviewed site and how to log-in to Discovery Ed. 5. Shared and reviewed KUD and SLM for Tchoukball, will need to begin acquistion lessons for unit. Shared equipment as well. 1. Attempted to connect from each of our own homes through google hangout video conferencing, but Ms. Minka’s audio didn’t work. We switched to FACETIME and met that way as both of our weekly meetings were cancelled due to snow. Wanted to collaborate on a document, but that didn’t work either as we weren’t sure exactly what to do. Our google training for PE was postponed due to snow. 2. Focused on an illegal drug unit to begin 12/12/13. Look over questions & instructions for a modified I Search Research Project.Looked over a rubric that was created for a more formal research paper. Still could apply. Will put the rubric to a test run of questions. 3. Tried to troubleshoot a sharing issue on Amy’s computer for google docs and permissions. She may need to get her email or account linked to school and not a personal gmail account. (Amy - I didn’t tell you this, but we need to check it out and let Courtney or Tom know before Monday). Otherwise when I share docs with you … you should be able to share it. 4. Created an account for Discovery Education Streaming, and went through a brief overview of teacher materials and how to save videos to my content. 5. Briefly discussed a Tchoukball action plan. 1. Become familiar with Discover Ed. 2. Continue with I Search Project revisions / or research paper instructions and rubric. May be difficult without the Google Training that was cancelled. 3. I will look for Tchoukball LFS materials. 4. Each try to create & email to each other prior to meeting? 1. Begin to build the illegal drug project utilizing KUD and SLM & incorporate into Learning Focused platform for acquisition lessons. 1. Tom Gavin's tech night on 12/17 (if you can) ... don't mean to be bossy! 3. A2 Dates for Amy’s students to take a trip to WP’s gym. 2. Coordinated pacing guide, and determined our next unit of focus will be an illegal drug unit to begin 12/12/13. We will begin planning a google research project that will include: Use of Holt Text & Google Drive & Google Research. 3. Introduction to Powtoons learning platform. Viewed workspace and a finished product on the FITT Formula used in Physical Education. 4. Contacted Actively Learn to see if teachers can share learning modules. 1. Find best tech standards to incorporate into drug research project. W.9-10.7 Conduct research projects to answer a question or solve a problem; narrow or broaden the inquiry when appropriate; synthesize multiple sources on the subject, demonstrating understanding of the subject under investigation. 3. Each try to create & email to each other prior to meeting? Learning Focused platform for acquisition lessons. 1. Who is interested in the IPAD technology and willing to participate in training for various strategies using it (with follow up and implementation?). Training and follow up would be required to receive the IPAD. You’d be paid and receive clock hours. 2. In what ways might we use the IPADs to support your program? 3. Scope and sequence is on 12/5. 5. Tom Gavin's tech night on 12/17 (if you can) ... don't mean to be bossy! 1. Revised and reflected on table tennis assessment. Clarified rulings in table tennis, & began to determine future home for this assessment to incorporate technology. Options: Edmodo, Schoology, Socrative, Google Form, (other?). 2. Incorporated CCSS ELA SL.9-10.4: Presentation of Knowledge and ideas into the table tennis SLM. 3. LFS - Reviewed Acquisition Lesson planning format. Went through each area in order to begin to develop acquisition lessons for for table tennis. * Need to review acquisition prompts for instruction. 4. Actively Learn - previewed the learning module about stress from student perspective. 1. Get Amy the LFS options for each segment of the LFS lesson plan. 2. Narrow down tech standards to begin to incorporate into our lessons. 3. Contact Actively Learn to see if we can share modules with each other. 4. Find the answer to the ping pong question about it hitting the table. 5. Coordinate our pacing guides. 1. Revise Actively Learn questions trying to incorporate quadrant questions. 2. Incorporate (1) Tech and (1) ELA standard into our current units. 3. Link your Blendspace into your Weebly. (I have to review how to do this). 4. Next we will go in and view Actively Learn from the student perspective. 1. Scope and sequence is on 12/5. 3. Tom Gavin's tech night on 12/17 (if you can) ... don't mean to be bossy! Note: Add to a future agenda to have student access "something" to view on their own in order to use immediately in the classroom upon their arrival. 1st true attempt at flipping the classroom. (If we know a student or group of students do not have access to technology, we can show them the "something" at the end of the previous class. 11/25: Blendspce for Table Tennis / LFS: shared, revised KUD and SLM for Table Tennis / Introduced Actively Learn Layered Learning Module for Stress. 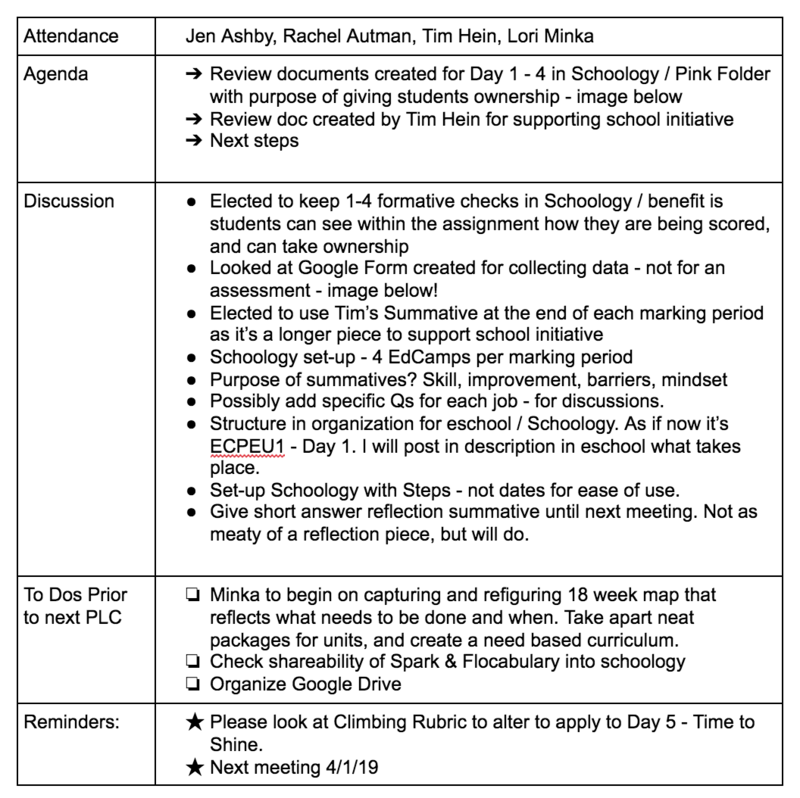 Agenda: View Actively Learn from student perspective, Incorporate Tech and ELA standards into lessons chosen lesson, and Link Blendspace to Weebly. Begin to discuss data implementation. What data would be most beneficial to utilize to drive student learning in PE and in Health? 10/2/13: B2 - 8th Period / PE PLC - Fitnessgram Data Driven Analysis. Enter Fitnessgram scores and compare results from statistical data provided. Run student and teacher reports. 9/26/13: B2 - 8th Period / PE PLC - Clarifying the Shifts in 21st Century Learning Article clarifying shifts in thinking for educators and students alike. Analyzed LAX Student Learning Map and revised based on what worked and what didn't.